Khawla Basheer Abdeen tells this story to convey the sacred role of the Muslim woman in both her family and society. With Islamic State (IS) occupying territory in Iraq and Syria, Jordan borders some of the most dangerous conflict zones in the world. The country remains stable domestically but, according to 2014 figures, Jordan is the largest contributor of foreign fighters in Syria. 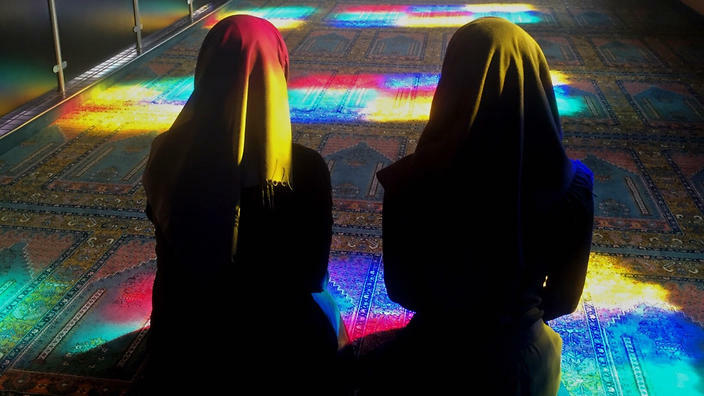 This year, the Jordanian Ministry of Islamic Affairs has encouraged 150 female preachers, also known as Sheikhas, to hold sessions in their communities to refute extremist Islamic ideology. Abdeen is one of them. She has been a Sheikha since graduating from the University of Jordan in 1974. She has written 11 books on topics including the role of women in society and the purpose of life and death. She is now Amman’s most experienced Sheikha, although she says she was not always so focused on religion. “I have changed from a carefree young girl interested in fashion and everything else to someone who has a message. A message that I am learning as I am spreading,” she says. Her message is one of tolerance, honesty, equality and what she calls “good deeds”. Nowadays, Abdeen holds up to three religious classes per day in mosques across the city. She explains that mosques can be intimidating for women, so on Sundays she teaches from home. Abdeen’s home is an apartment on the third storey of a white stone building. To the right of the front door is a placard with a verse from the Quran. Inside, olive green walls are lined with family photographs in golden frames. Abdeen’s daughter brings us strong coffee in small ceramic cups. Inside her home, the Sheikha is unveiled and wears a bright purple dress with sequins down its front. “The prophet told us to be moderate believers, not to be extreme, not to be terrorists,” she explains. Women are seen as “pillars” of the family, and are thus able to have a pervasive influence on their children. They are also able to serve as an early warning system for extremist ideology within their community, according to a new report by the UN. “If a mother comes and says ‘my daughter is becoming radicalised’, I would like to meet her. I want to talk to her and open her mind and find out what is it she is trying to get to. Let’s have a discussion, let’s understand. If I leave her, she will become worse,” Abdeen says. Abdeen believes radicalisation occurs only when Muslims begin to follow individuals who have made their own interpretations of the religion, rather than taking guidance from Islam’s two primary texts: the Quran and Sunnah. “If you follow God’s words and you don’t follow people, you will not be radicalised. Following certain people leads to radicalisation,” she says. Abdeen inspires women to take her message and spread it in their homes and communities. “They are looking at me and what I want to do. I’m the mother for them,” she tells SBS. Women are seen as “pillars” of the family, and are thus able to have a pervasive influence on their children. The following day on the other side of town in a middle-to-upper class area of the city, more than 100 veiled women have gathered to raise money for a local orphanage. The event is being held in a big community centre with high ceilings, chandeliers and round tables of 10 seats. 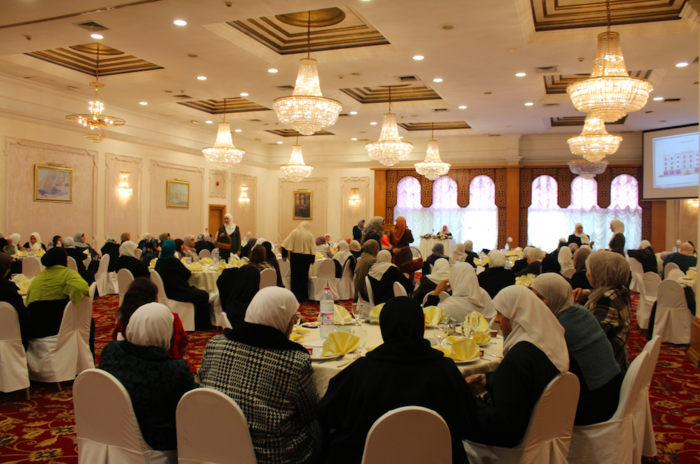 Women of all ages come to listen to Abdeen. It is events like these that enable moderate influences to spread their message through the community. The amplification of credible voices normalise these teachings of Islam, according to the report. This community and women-driven response to peace education are believed to be a powerful force against radicalisation in Jordanian society. “The first person you have to look out for is yourself. That has to come before your children, your husband. That is why we are here,” Abdeen tells the crowd. The attendees want to raise money for the poor. A wicker basket is carried around the room by a young woman. People put dinar notes in the basket.